We contacted Andre (after reading the other Tripadvisor entries) and booked a tour. The tour, especially the trips in vintage cars to the individual wineries, was very relaxing. Andre could tell us a lot about the history of the area and also about the individual wineries and wines. Overall, it was a very entertaining, entertaining afternoon, in which the wine enjoyment is not neglected. Highly recommended. Fantastic way to experience the Robertson Wine Valley. Highly recommended! What a great tour (again)! 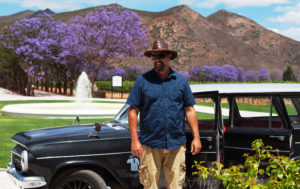 Andre did such a great tour with us 1year ago (see my 1/2017 review) so we not only followed his recommendation to stay at McGregor area (#Tanagra wine farm) this year but also booked Andre again for a wine tour. It was a full day tour this time and worth it! He picked us up in the morning and dropped us back at the accommodation in the late afternoon. It was much more than a wine tour: small and very special wineries you might not find on your own, visit at a fruit distributor where you can get fruits that were picked right from the local trees, a great and highly interesting olive oil and olive tasting, a drive “off the roads” and into the countryside. Great wines, great tasting experience, great landscape, great food including a picnic made by Andre! And so much information on the area, the wines, the people, the country that you can only get from somebody who is not only local but loves what he does and where he lives and is willing to share it! It was an absolute pleasure with you today! Stay as you are and all the best to you and your family! Check out our new project 60seconds.travel! Andre picked us up with his classic car at Mo & Rose at Soekershof and out incl. Tasting in 5 wineries. It was the first time that we did a wine tasting. As Andre knows very well with wine, he was able to adapt the tour according to our wishes and looked, we could always try a wide variety of wines at the wineries. He also told us while driving a lot of information and interesting facts about the area. Highly recommended tour if you stay in the Wine Valley! Thanks a lot for the great day yesterday. We are looking forward to see you next year for the barbecue für 5 on May 14th and the wine tour for 5 on May 15th, Susanne’s birthday. I will send you a more detailed mail when we are back in Germany. Warum nicht die Freude am Wein mit der Freude an alten Autos verbinden? Auf der Suche nach einer Tour durch die Weinregion bei Robertson sind wir auf die Internetseite von Andre gestoßen. Nach ein paar Mails hin und her konnten wir seine Vorschläge und Empfehlungen mit unseren Ideen in einer schönen Tour vereinen. Nach Abholung bei unserem Guesthouse in Robertson hatte Andre einiges über die Geschichte seines alten Holden, die Geschichte Südafrikas sowie die Region und die besuchten Weingüter zu berichten. Die Fahrt mit dem Holden war sehr entspannt und entschleunigte ebenso wie die Weinproben bei Zandvliet, Esona, De Wetshof sowie Springfield. Trotzdem verging die Zeit wie im Fluge. Wir hätten noch viel länger über alte Autos, Wein, Südafrika und die Welt sprechen können. Ein sehr schöner Tag. Im Preis enthalten war nicht nur die Fahrt, sondern auch die Weinproben sowie seine selbstgemachte Käseplatte. Alles in allem ein Erlebnis. Gerne wieder. Myself and my wife took this tour with Andre on our honeymoon and really enjoyed it. put us under any pressure like many of the larger more commercial tours. The wineries that we visited were really special and varied, with unique grapes and blends. We also particularly enjoyed the additional (optional) brandy tasting. We would highly recommend the tour if in the region. The classic car added a romantic vibe to the experience. Owen and Alma (Ireland – Tripadvisor). Thank you for making our first proper wine tasting experience a great one. Andre picked us up at our accommodation and from there we experienced the beautiful wine farms in Robertson. Driving around in the Holden was such a relaxing way do wine tasting especially with all the wines we tasted! Andre thank you again for making this a day to remember and for all the knowledge you brought. We will definitely be back to experience the other farms and another drive in the Holden. To start with the summary: Thanks for this great tour! driving yourself – due to the great number of good wines you need to taste in Robertson. We booked only a day before, which worked out perfectly, and were picked up at the guest house after breakfast. Viljoensdrift and Springfield. A very interesting mixture and a nice drive around the Robertson area. Esona was our highlight, both setting, personal and professional tasting experience as well as the wines itself! Life in SA with us – so it was a very relaxing, informative and personal tour! We look forward to come back and do a further tour!!! A belated thank you to you in respect of our wine tour and river cruise on 19 February 2015. 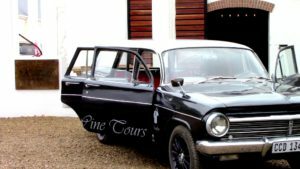 We had an absolutely fantastic day and enjoyed be chauffeured around in your 1964 Holden. Hi Robertson Tours. Thanks for the great transfer to the airport. 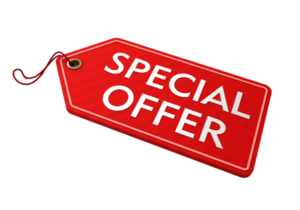 I will definitely recommend your services to anyone needed a transfer or tour operator! One of the best times I’ve ever had. Our first experience of the Robertson valley but definitely one of the best. Andre was amazing and so knowledgeable. His knowledge of the Robertson area and the wineries was astounding. Andre sat with us describing about the wineries and the history of each farm and the people who live and work there. The day went on with more amazing experiences and awesome memories made. Some odd 30+ bottles bought and still going strong. What a time! with each adding something special. But Andre is a gifted man. If you want a tour where you learn history science and fun? makes the tour fun and vibrant. I did this tour for my birthday and it was the best birthday ever. Thank you Andre for amazing tour. Thank you for the really Nice day!